The SavingsPinay Series is back! Last month I decided to bring back the blog series and on my Must Do’s Before 2015 Ends I mentioned that I am planning on making three blog series. One for October (DONE! ), another for November and last but not the least will be December. To recap, the SavingsPinay Series is created for in-depth look/thorough explanation of a particular subject or topic. This November I will be focusing on something close to my heart. My first ever investment vehicle, MUTUAL FUND. Before I jump with the overview of this new series let me sincerely apologize for what happened over the October series. I was one week delayed in publishing Day 2 to Day 5 of the series and I know this had affected how effective the series was. I also like to thank those who waited for the continuation of the series and still give views to each Utang Series post. Yumaman sa Mutual Fund is a four day-long series that focuses on every thing about Mutual Fund. In this series I will share my personal experience investing in a mutual fund for almost two years. I will also give insights, tips and tricks on how you can start investing in mutual fund. At the end of the series we will also unbuckle the major question whether it’s possible to become rich investing in mutual fund. The first post in the series is definitely something you shouldn’t miss. It is an ultimate guide for those who are curious about Mutual Fund. I will explain what it is, to whom it is perfect for, to where you should invest one, to the right time you should invest, to why you should try a mutual and to how you can get started. At the end of the post I’ll share the Top 10 Frequently Asked Questions regarding Mutual Fund for your reference. Now that you have a solid foundation on the what’s and how’s of a mutual fund the next task is to know how you can choose the mutual fund to invest with. This is a part where you should take time to ponder and decide since there are numerous type of mutual fund available and there are different expert financial companies offering their help. In this post I will try to compare between companies and between fund facts. At the end of the post I’ll share the Top 10 Best Performing Mutual Fund for your reference. Though Mutual Fund is one of the most popular investment vehicle created specially for beginners there are some secrets that investors ought to know. This post is a valuable and worthy article to read and can help you decide whether its truly the investment option you should try. At the end of the post I’ll share the Top 10 Ways You Can Invest in Mutual Fund with Your Limited Income. 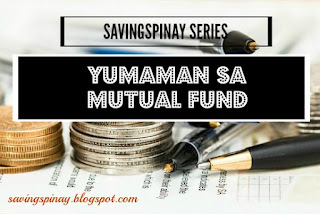 Kaya nga kayang yumaman sa Mutual Fund? In the last entry for this November SavinsgPinay Series I will give a cheat sheet on how you can get rich with mutual fund. Mutual Fund is said to be the safest investment vehicle and this post will guarantee a lot of learning how to get rich with your mutual fund account. At the end of the post I’ll share the Top 10 Strategies to Grow Your Mutual Fund Money. Hopefully publishing this series won’t be delayed. I hope that you will learn from this series and you are looking forward to the learning. Do you have a mutual fund account? Are you curious in what Mutual Fund is all about? Share your answers in the comment section below!